You can change the appearance of text for the entire table or just for specific table cells. You can change the font, color, size, and other attributes of text in table cells. Change all text in a table: Select the table. Change the text in specific cells: Select the cells with the text you want to change. In the Text pane of the Format inspector, choose a paragraph style from the pop-up menu at the top of the pane, or use the controls in the Font section. For more information about using the font controls, see Change the look of text. You can increase or decrease the font size proportionally for all text in the table. When you make the text larger or smaller, all text increases or decreases by the same percentage. In the Table pane of the Format inspector, click the Table Font Size buttons. If the cell is not wide enough to display the text on one line, you can wrap the text so it appears on multiple lines in the cell. Wrap text in a cell: Control-click the cell, then choose Wrap Text. A checkmark appears next to Wrap Text when it’s selected. Wrap text for a row or column: Select the row or column. In the Text pane of the Format inspector, select the Wrap text in cell checkbox. Wrap all text in a table: Select the table. In the Text pane of the Format inspector, select the Wrap text in cell checkbox. 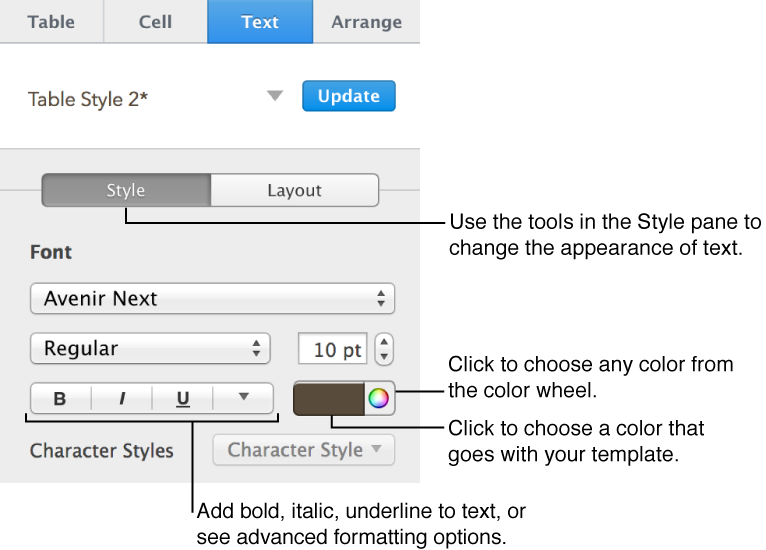 You can create rules to automatically change a cell’s appearance when the value in the cell meets certain conditions. For more information, go to Add conditional highlighting to cells.